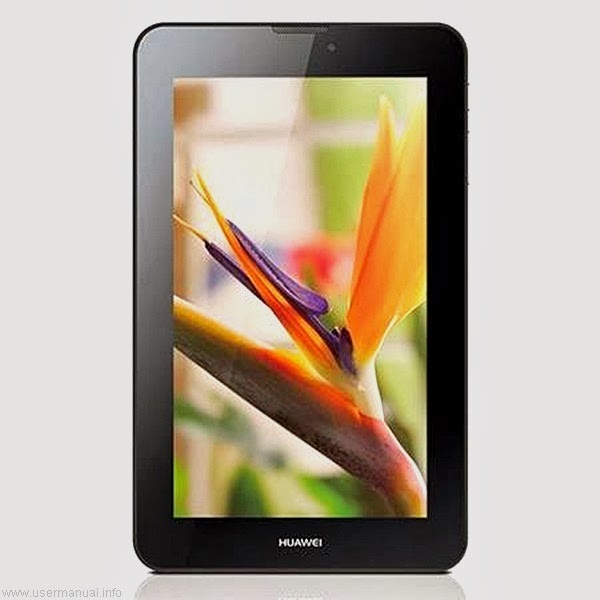 Huawei MediaPad 7 Vogue user guide manual – Huawei MediaPad 7 Vogue was released on July 2013 and its second edition of seven inches of MediaPad series with premium aluminum package body. Huawei MediaPad 7 Vogue design with nice performance with great premium aluminum, which rarely find on another Android tablet as the advantage. Huawei MediaPad 7 Vogue performance on mediocare screen display although its bring 7.0 IPS LCD capacitive touchscreen display but with 600 x 1024 pixels. Huawei MediaPad 7 Vogue equipped with specifications and key features such as: 193.8 x 121.3 x 9.5 mm (7.63 x 4.78 x 0.37 inches) in dimension with 335 g (11.82 oz) for its weight, 7.0 inches IPS LCD capacitive touchscreen display 600 x 1024 pixels screen display 16 million colors with multitouch and Emotion U.I 1.5, microSD up to 32 GB, 8 GB internal storage, 1 GB of RAM, 3.2 megapixel rear facing camera, 0.3 megapixel front facing camera, run Android 4.2 Jelly Bean operating system, powered by 1.2 GHz quad core Huawei K3V2 processor and Li-Po 4100 mAH battery with up to 20 hours of talk time. Huawei MediaPad 7 Vogue user guide manual available to download in pdf file format with 4.05 MB size and contains of pages. The manual pdf Huawei MediaPad 7 Vogue user guide manual will explain everything every new users needed to know such as: apps, wireless network, faqs and other settings.